Not to be confused with Gauls. This article is about the Gaelic people. For other uses, see Gael (disambiguation). The Gaels (/ɡeɪlz/; Irish: Na Gaeil [ɡeːlˠ]; Scottish Gaelic: Na Gàidheil [ˈkɛː.əl̪ˠ]; Manx: Ny Gaeil) are an ethnolinguistic group native to northwestern Europe. [a] They are associated with the Gaelic languages: a branch of the Celtic languages comprising Irish, Manx and Scottish Gaelic. Historically, the ethnonyms Irish and Scots referred to the Gaels in general, but the scope of those nationalities is today more complex. Gaelic language and culture originated in Ireland, extending to Dál Riata in western Scotland. In antiquity the Gaels traded with the Roman Empire and also raided Roman Britain. In the Middle Ages, Gaelic culture became dominant throughout the rest of Scotland and the Isle of Man. There was also some Gaelic settlement in Wales and Cornwall. In the Viking Age, small numbers of Vikings raided and settled in Gaelic lands, becoming the Norse-Gaels. In the 9th century, the Scots Gaels of Dál Riata merged with Pictland to form the Gaelic Kingdom of Alba. Meanwhile, Gaelic Ireland was made up of several kingdoms, with a High King often claiming lordship over them. In the 12th century, Normans conquered parts of Ireland (leading to centuries of conflict), while parts of Scotland became Normanized. However, Gaelic culture remained strong throughout Ireland, the Scottish Highlands and Galloway. In the early 17th century, the last Gaelic kingdoms in Ireland fell under English control. James I sought to subdue the Gaels and wipe out their culture; in Ireland by colonizing Gaelic land with English-speaking British settlers, and in the Scottish Highlands via repressive laws such as the Statutes of Iona. In the following centuries the Gaelic language was suppressed and mostly supplanted by English. However, it continues to be the main language in Ireland's Gaeltacht and Scotland's Outer Hebrides. The modern descendants of the Gaels have spread throughout Britain, the Americas and Australasia. Traditional Gaelic society is organised into clans, each with its own territory and king (or lord), elected through tanistry. The Irish were previously pagans who worshipped the Tuatha Dé Danann, venerated the ancestors and believed in an Otherworld. Their four yearly festivals – Samhain, Imbolc, Beltane and Lughnasa – continued to be celebrated into modern times. The Gaels have a strong oral tradition, traditionally maintained by shanachies. Inscription in the ogham alphabet began in the 4th century. Their conversion to Christianity accompanied the introduction of writing in the Roman alphabet, and Irish Gaelic has the oldest vernacular literature in western Europe. Irish mythology and Brehon law were preserved, albeit Christianised. Gaelic monasteries were renowned centres of learning and played a key role in developing Insular art, while Gaelic missionaries and scholars were highly influential in western Europe. In the Middle Ages, most Gaels lived in roundhouses and ringforts. 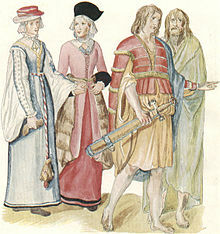 The Gaels had their own style of dress, which (in Scotland) became the belted plaid and kilt. They also have distinctive music, dance, and sports. Gaelic culture continues to be a major component of Irish, Scottish and Manx culture. Throughout the centuries, Gaels and Gaelic-speakers have been known by a number of names. The most consistent of these have been Gael, Irish and Scots. The latter two have developed more ambiguous meanings, due to the early modern concept of the nation state, which encompasses non-Gaels. Other terms, such as Milesian, are not as often used. An Old Norse name for the Gaels was Vestmenn ('Westmen'). Informally, archetypal forenames such as Tadhg or Dòmhnall are sometimes used for Gaels. The word Gaelic is first recorded in print in the English language in the 1770s, replacing the earlier word Gathelik which is attested as far back as 1596. Gael, defined as a "member of the Gaelic race", is first attested in print in 1810. The name ultimately derives from the Old Irish word Goídel/Gaídel, commonly spelled Gaoidheal in pre-spelling reform Modern Irish, but today officially spelled Gaeil or Gael (the word is spelled Gael in Manx and Gàidheal in Scottish Gaelic). In early modern Irish, the words Gaelic and Gael were spelled respectively Gaoidhealg (Goídelc in Old Irish) and Gaoidheal. The more antiquarian term Goidels came to be used by some due to Edward Lhuyd's work on the relationship between Celtic languages. This term was further popularised in academia by John Rhys; the first Professor of Celtic at Oxford University; due to his work Celtic Britain (1882). According to the scholar John T. Koch, the Old Irish form of the name, Goídel (also spelled Gaídel), was borrowed from a Primitive Welsh form Guoidel roughly meaning 'forest people', 'wild men' or, later, 'warriors'. Old Welsh Guoidel is recorded as a personal name in the Book of Llandaff. The root of the name is cognate at the Proto-Celtic level Old Irish fíad 'wild', and Féni, derived ultimately from the Proto-Indo-European *weidh-n-jo-. This latter word is the origin of Fianna and Fenian. The Iverni are one of the population groups mentioned in Ptolemy's Geographia. A common name, passed down to the modern day, is Irish; this existed in the English language during the 11th century in the form of Irisce, which derived from the stem of Old English Iras "inhabitant of Ireland", from Old Norse irar. The ultimate origin of this word is thought to be from the Old Irish Ériu, which is from Old Celtic *Iveriu, likely associated with the Proto-Indo-European term *pi-wer- meaning "fertile". Ériu is mentioned as a goddess in the Lebor Gabála Érenn as a daughter of Ernmas of the Tuatha Dé Danann. Along with her sisters Banba and Fódla, she is said to have made a deal with the Milesians to name the island after her. The ancient Greeks; in particular Ptolemy in his 2nd century Geographia, possibly based on earlier sources; located a group known as the Iverni (Greek: Ιουερνοι) in the south-west of Ireland. This group has been associated with the Érainn of Irish tradition by T. F. O'Rahilly and others. The Érainn; claiming descent from a Milesian eponymous ancestor named Ailill Érann; were the hegemonic power in Ireland prior to the rise of the descendants of Conn of the Hundred Battles and Mug Nuadat. The Érainn included peoples such as the Corcu Loígde and Dál Riata. Ancient Roman writers, such as Caesar, Pliny and Tacitus, derived from "Ivernia" the name Hibernia. Thus the name Hibernian also comes from this root (although the Romans tended to call the isle Scotia, and the Gaels "Scoti"). From the 5th to 10th centuries, early Scotland was home to the following people and cultures: the Picts, Dál Riata also known as Gaels, the Britons, Angles and the Vikings. The Romans began to use the term Scoti to describe the Gaels in Latin from the 4th century onward. In the context of the times, the Gaels were raiding the west coast of Britain for hostages, and they took part in the Great Conspiracy; it is thus conjectured that the term means "raider, pirate". Although the Dál Riata settled in Argyll in the 6th century, the term "Scots" did not just apply to them, but to Gaels in general. Examples can be taken from Johannes Scotus Eriugena and other figures from Hiberno-Latin culture and the Schottenkloster founded by Irish Gaels in Germanic lands. It is also worth noting that eponymous characters were created in medieval Irish pseudo-histories: Scota, described as an Egyptian princess, and her husband Goídel Glas. The Gaels of northern Britain referred to themselves as Albannaich in their own tongue and their realm as the Kingdom of Alba (founded as a successor state to Pictland and Dál Riata). Germanic groups tended to refer to the Gael as "Scottas" and so when Anglo-Saxon influence grew at court with Duncan II, the Latin Rex Scottorum began to be used and the realm was known as Scotland; this process and cultural shift was put into full effect under David I, who let the Normans come to power and furthered the Lowland-Highland divide. Lowland Germanics in Scotland spoke a language called Inglis, which they started to call Scottis (Scots) in the 16th century, while they in turn began to refer to Scottish Gaelic as Erse (from 'Irish'). Clan tartan of the MacGregors. Distinctive patterns were adopted during the Victorian era. In traditional Gaelic society, a patrilineal kinship group is referred to as a clann; this signifies a dynastic grouping descended from a common ancestor, much larger than a personal family, which may also consist of various kindreds and septs. Using the Munster-based Eóganachta as an example, members of this clann claim patrilineal descent from Éogan Mór. It is further divided into major kindreds, such as the Eóganacht Chaisil, Glendamnach, Áine, Locha Léin and Raithlind. These kindreds themselves contain septs that have passed down as Irish Gaelic surnames, for example the Eóganacht Chaisil includes O'Callaghan, MacCarthy, O'Sullivan and others. The Irish Gaels can be grouped into the following major historical groups; Connachta (including Uí Néill, Clan Colla, Uí Maine, etc. ), Dál gCais, Eóganachta, Érainn (including Dál Riata, Dál Fiatach, etc. ), Laigin and Ulaid (including Dál nAraidi). In the Highlands, the various Gaelic-originated clans tended to claim descent from one of the Irish groups, particularly those from Ulster. The Dál Riata (i.e. – MacGregor, MacDuff, MacLaren, etc.) claimed descent from Síl Conairi, for instance. 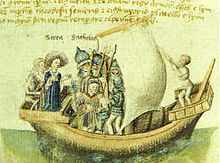 Some arrivals in the High Middle Ages (i.e. – MacNeill, Buchanan, Munro, etc.) claimed to be of the Uí Néill. As part of their self-justification; taking over power from the Norse-Gael MacLeod in the Hebrides; the MacDonalds claimed to be from Clan Colla. For the Irish Gaels, their culture did not survive the conquests and colonisations by the English between 1534 and 1692 (see History of Ireland (1536–1691), Tudor conquest of Ireland, Plantations of Ireland, Cromwellian conquest of Ireland, Williamite War in Ireland. As a result of the Gaelic revival, there has been renewed interest in Irish genealogy; the Irish Government recognised Gaelic Chiefs of the Name since the 1940s. The Finte na hÉireann (Clans of Ireland) was founded in 1989 to gather together clan associations; individual clan associations operate throughout the world and produce journals for their septs. The Highland clans held out until the 18th century Jacobite risings. During the Victorian-era, symbolic tartans, crests and badges were retroactively applied to clans. Clan associations built up over time and Na Fineachan Gàidhealach (The Highland Clans) was founded in 2013. At the turn of the 21st century, the principles of human genetics and genetic genealogy were applied to the study of populations of Irish origin. 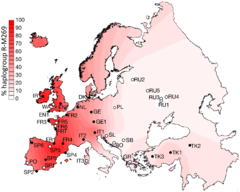 It was found that the overwhelming majority belonged to haplogroup R1b in their Y-chromosome DNA (as with much of Western Europe). The two other peoples who recorded higher than 85% for R1b in a 2009 study published in the scientific journal, PLOS Biology, were the Welsh and the Basques. The development of in-depth studies of DNA sequences known as STRs and SNPs have allowed geneticists to associate subclades with specific Gaelic kindred groupings (and their surnames), vindicating significant elements of Gaelic genealogy, as found in works such as the Leabhar na nGenealach. Examples can be taken from the Uí Néill (i.e. – O'Neill, O'Donnell, Gallagher, etc. ), who are associated with R-M222 and the Dál gCais (i.e. – O'Brien, McMahon, Kennedy, etc.) who are associated with R-L226. With regard to Gaelic genetic genealogy studies, these developments in subclades have aided people in finding their original clan group in the case of a non-paternity event, with Family Tree DNA having the largest such database at present. In countries where Gaels live, census records documenting population statistics have exist. The following chart shows the number of speakers of a Gaelic language (either "Gaeilge," also known as Irish, "Gàidhlig," known as Scottish Gaelic, or "Gaelg," known as Manx). The question of ethnic identity is slightly more complex, but included below are those who identify as ethnic Irish or Scottish. It should be taken into account that not all are of Gaelic descent, especially in the case of Scotland, due to the nature of the Lowlands. It also depends on the self-reported response of the individual and so is a rough guide rather than an exact science. The two comparatively "major" Gaelic nations in the modern era are Ireland (which in the 2002 census had 185,838 people who spoke Irish "daily" and 1,570,894 who were "able" to speak it) and Scotland (58,552 fluent "Gaelic speakers" and 92,400 with "some Gaelic language ability" in the 2001 census). Communities where the languages still are spoken natively are restricted largely to the west coast of each country and especially the Hebrides islands in Scotland. However, a large proportion of the Gaelic-speaking population now lives in the cities of Glasgow and Edinburgh in Scotland, and Donegal, Galway, Cork and Dublin in Ireland. There are about 2,000 Scottish Gaelic speakers in Canada (Canadian Gaelic dialect), although many are elderly and concentrated in Nova Scotia and more specifically Cape Breton Island. According to the U.S. Census in 2000, there are more than 25,000 Irish-speakers in the United States, with the majority found in urban areas with large Irish-American communities such as Boston, New York City and Chicago. As the Western Roman Empire began to collapse, the Irish (along with the Anglo-Saxons) were one of the peoples able to take advantage in Great Britain from the 4th century onwards. The proto-Eóganachta Uí Liatháin and the Déisi Muman of Dyfed both established colonies in today's Wales. Further to the north, the Érainn's Dál Riata colonised Argyll (eventually founding Alba) and there was a significant Gaelic influence in Northumbria and the MacAngus clan arose to the Pictish kingship by the 8th century. Gaelic Christian missionaries were also active across the Frankish Empire. With the coming of the Viking Age and their slave markets, Irish were also dispersed in this way across the realms under Viking control; as a legacy, in genetic studies, Icelanders exhibit high levels of Gaelic-derived mDNA. Since the fall of Gaelic polities, the Gaels have made their way across parts of the world, successively under the auspices of the Spanish Empire, French Empire, and the British Empire. Core destinations for were Iberia, France, the West Indies, North America (what is today the United States and Canada) and Oceania (Australia and New Zealand). There has also been a mass "internal migration" within Ireland and Britain from the 19th century, with Irish and Scots migrating to the English-speaking industrial cities of London, Dublin, Glasgow, Liverpool, Manchester, Birmingham, Cardiff, Leeds, Edinburgh and others. Many underwent a linguistic "Anglicisation" and eventually merged with Anglo populations. In their own national epic contained within medieval works such as the Lebor Gabála Érenn, the Gaels trace the origin of their people to an eponymous ancestor named Goídel Glas. He is described as a Scythian prince (the grandson of Fénius Farsaid), who is credited with creating the Gaelic languages. Goídel's mother is called Scota, described as an Egyptian princess (some modern writers associate her with Meritaten). The Gaels are depicted as wandering from place to place for hundreds of years; they spend time in Egypt, Crete, Scythia, the Caspian Sea and Getulia, before arriving in Iberia, where their king, Breogán, is said to have founded Galicia. The Gaels are then said to have sailed to Ireland via Galicia in the form of the Milesians, sons of Míl Espáine. The Gaels fight a battle of sorcery with the Tuatha Dé Danann, the gods, who inhabited Ireland at the time. Ériu, a goddess of the land, promises the Gaels that Ireland shall be theirs so long as they pay tribute to her. They agree, and their bard Amergin recites an incantation known as the Song of Amergin. The two groups agree to divide Ireland between them: the Gaels take the world above, while the Tuath Dé take the world below (i.e. the Otherworld). Advances in DNA studies have revealed some clues about the origin of the Gaels (who are associated with paternal R-L21). Haplogroup R originated 26,800 years ago in Central Asia during the Last Ice Age. The R1b branch had broken off by the Paleolithic and its derivative R-M269 was found at the Pontic-Caspian steppe by the Chalcolithic (the Kurgan hypothesis makes these speakers of Proto-Indo-European). First entering Europe proper 7,000 years ago, the Indo-Europeans developed bronze weapons and domesticated the horse, giving them the upper hand in their conquest of the Old Europe and the proliferation of their lineages. After the R-L51 subclade founded the Unetice culture, a derivative R-L21 moved West, arriving in Britain c. 2100 BCE and Ireland c. 2000 BCE, becoming the Gaelic people. The Lia Fáil at the Hill of Tara, sacred site of inauguration for the Gaelic High Kings. According to the Annals of the Four Masters, the early branches of the Milesian Gaels were the Heremonians, the Heberians and the Irians, descended from the three brothers Érimón, Éber Finn and Ír respectively. Another group were the Ithians, descended from Íth (an uncle of Milesius) who were located in South Leinster (associated with the Brigantes) but they later became extinct. The Four Masters date the start of Milesian rule from 1700 BCE. Initially, the Heremonians dominated the High Kingship of Ireland from their stronghold of Mide, the Heberians were given Munster and the Irians were given Ulster. At this early point of the Milesian-era, the non-Gaelic Fir Domnann held Leinster and the Fir Ol nEchmacht held what was later known as Connacht (possibly remnants of the Fir Bolg). During the Iron Age there was heightened activity at a number of important royal ceremonial sites, including Tara, Dún Ailinne, Rathcroghan and Emain Macha. Each was associated with a Gaelic tribe. The most important was Tara, where the High King (also known as the King of Tara) was inaugurated on the Lia Fáil (Stone of Destiny), which stands to this day. According to the Annals, this era also saw, during the 7th century BCE, a branch of the Heremonians known as the Laigin, descending from Úgaine Mór's son Lóegaire Lorc, displacing the Fir Bolg remnants in Leinster. This was also a critical period for the Ulaid (earlier known as the Irians) as their kinsman Rudraige Mór took over the High Kingship in the 3rd century BCE; his offspring would be the subject of the Ulster Cycle of heroic tradition, including the epic Táin Bó Cúailnge. This includes the struggle between Conchobar mac Nessa and Fergus mac Róich. After regaining power, the Heremonians, in the form of Fíachu Finnolach were overthrown in a 1st-century AD provincial coup. His son, Túathal Techtmar was exiled to Roman Britain before returning to claim Tara. Based on the accounts of Tacitus, some modern historians associate him with an "Irish prince" said to have been entertained by Agricola, Governor of Britain and speculate at Roman sponsorship. His grandson, Conn Cétchathach, is the ancestor of the Connachta who would dominate the Irish Middle Ages. They gained control of what would now be named Connacht. Their close relatives the Érainn (both groups descend from Óengus Tuirmech Temrach) and the Ulaid would later lose out to them in Ulster, as the descendants of the Three Collas in Airgíalla and Niall Noígíallach in Ailech extended their hegemony. The Isles in the 5th century. Christianity reached Ireland during the 5th century, most famously through a Romano-British slave Patrick, but also through Gaels such as Declán, Finnian and the Twelve Apostles of Ireland. The abbot and the monk eventually took over certain cultural roles of the aos dána (not least the roles of druí and seanchaí) as the oral culture of the Gaels was transmitted to script by the arrival of literacy. Thus Christianity in Ireland during this early time retained elements of Gaelic culture. In the Middle Ages, Gaelic Ireland was divided into a hierarchy of territories ruled by a hierarchy of kings or chiefs. The smallest territory was the túath (plural: túatha), which was typically the territory of a single kin-group. Several túatha formed a mór túath (overkingdom), which was ruled by an overking. Several overkingdoms formed a cóiced (province), which was ruled by a provincial king. In the early Middle Ages the túath was the main political unit, but during the following centuries the overkings and provincial kings became ever more powerful. By the 6th century, the division of Ireland into two spheres of influence (Leath Cuinn and Leath Moga) was largely a reality. In the south, the influence of the Eóganachta based at Cashel grew further, to the detriment of Érainn clans such as the Corcu Loígde and Clann Conla. Through their vassals the Déisi (descended from Fiacha Suidhe and later known as the Dál gCais), Munster was extended north of the River Shannon, laying the foundations for Thomond. Aside from their gains in Ulster (excluding the Érainn's Ulaid), the Uí Néill's southern branch had also pushed down into Mide and Brega. By the 9th century, some of the most powerful kings were being acknowledged as High King of Ireland. 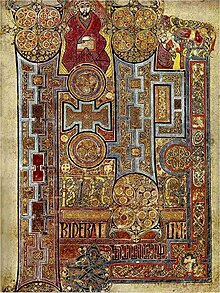 A page from the 9th century Book of Kells, one of the finest examples of Insular art. It is believed to have been made in Gaelic monasteries in Ireland and Scotland. Some, particularly champions of Christianity, hold the 6th to 9th centuries to be a Golden Age for the Gaels. This is due to the influence which the Gaels had across Western Europe as part of their Christian missionary activities. Similar to the Desert Fathers, Gaelic monastics were known for their asceticism. Some of the most celebrated figures of this time were Columba, Aidan, Columbanus and others. Learned in Greek and Latin during an age of cultural collapse, the Gaelic scholars were able to gain a presence at the court of the Carolingian Frankish Empire; perhaps the best known example is Johannes Scotus Eriugena. Aside from their activities abroad, insular art flourished domestically, with artifacts such as the Book of Kells and Tara Brooch surviving. Clonmacnoise, Glendalough, Clonard, Durrow and Inis Cathaigh are some of the more prominent Ireland-based monasteries founded during this time. There is some evidence that the Gaels may have visited the Faroe Islands and Iceland before the Norse, and that Gaelic monks known as papar lived there before being driven out by the incoming Norsemen. The late 8th century heralded outside involvement in Gaelic affairs, as Norsemen from Scandinavia, known as the Vikings, began to raid and pillage settlements looking for booty. The earliest recorded raids were on Rathlin and Iona in 795; these hit and run attacks continued for some time until the Norsemen began to settle in the 840s at Dublin (setting up a large slave market), Limerick, Waterford and elsewhere. The Norsemen also took most of the Hebrides and the Isle of Man from the Dál Riata clans and established the Kingdom of the Isles. At the same time, the Picts were becoming Gaelicised, and the Gaelic kingdom of Dál Riata merged with Pictland to form the Kingdom of Alba. Kenneth MacAlpin and the House of Alpin are most associated with this process. After a spell when the Norsemen were driven from Dublin by Leinsterman Cerball mac Muirecáin, they returned in the reign of Niall Glúndub, heralding a second Viking period. The Dublin Norse—some of them, such as Uí Ímair king Ragnall ua Ímair now partly Gaelicised as the Norse-Gaels—were a serious regional power, with territories across Northumbria and York. At the same time, the Uí Néill branches were involved in an internal power struggle for hegemony between the northern or southern branches. Donnchad Donn raided Munster and took Cellachán Caisil of the Eóganachta hostage. The destabilisation led to the rise of the Dál gCais and Brian Bóruma. Through military might, Brian went about building a Gaelic Imperium under his High Kingship, even gaining the submission of Máel Sechnaill mac Domnaill. They were involved in a series of battles against the Vikings: Tara, Glenmama and Clontarf. The last of these saw Brian's death in 1014. Brian's campaign is glorified in the Cogad Gáedel re Gallaib ("The War of the Gaels with the Foreigners"). The Irish Church became closer to Continental models with the Synod of Ráth Breasail and the arrival of the Cistercians. There was also more trade and communication with Normanised Britain and France. Between themselves, the Ó Briain and the Ó Conchobhair attempted to build a national monarchy. The remainder of the Middle Ages was marked by conflict between Gaels and Anglo-Normans. The Norman invasion of Ireland took place in stages during the late 12th century. Norman mercenaries landed in Leinster in 1169 at the request of Diarmait Mac Murchada, who sought their help in regaining his throne. By 1171 the Normans had gained control of Leinster, and King Henry II of England, with the backing of the Papacy, established the Lordship of Ireland. The Norman kings of England claimed sovereignty over this territory, leading to centuries of conflict between the Normans and the native Irish. The origins of a literary anti-Gaelic sentiment was born at this time, and developed by the likes of Gerald of Wales, as part of a propaganda campaign (with a Gregorian "reform" gloss) to justify taking Gaelic lands. Scotland also came under Anglo-Norman influence in the 12th century. The Davidian Revolution saw the Normanisation of Scotland's monarchy, government and church; the founding of burghs, which became mainly English-speaking; and the royally-sponsored immigration of Norman aristocrats. This Normanisation was mainly limited to the Scottish Lowlands. In Ireland, the Normans carved out their own semi-independent lordships, but many Gaelic Irish kingdoms remained outside Norman control and gallowglass warriors were brought in from the Highlands to fight for various Irish kings. In 1315, a Scottish army landed in Ireland as part of Scotland's war against England. It was led by Edward Bruce, brother of Scottish king Robert the Bruce. Despite his own Norman ancestry, Edward urged the Irish to ally with the Scots by invoking a shared Gaelic ancestry and culture, and most of the northern kings acknowledged him as High King of Ireland. However, the campaign ended three years later with Edward's defeat and death in the Battle of Faughart. 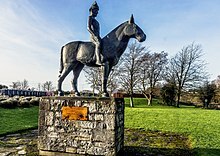 A Gaelic Irish resurgence began in the mid-14th century: English royal control shrank to an area known as the Pale and, outside this, many Norman lords adopted Gaelic culture, becoming culturally Gaelicised. The English government tried to prevent this through the Statutes of Kilkenny (1366), which forbade English settlers from adopting Gaelic culture, but the results were mixed and particularly in the West, some Normans became Gaelicised. During the 16th and 17th centuries, the Gaels were affected by the policies of the Tudors and the Stewarts who sought to anglicise the population and bring both Ireland and the Highlands under stronger centralised control, as part of what would become the British Empire. In 1542, Henry VIII of England declared the Lordship of Ireland a Kingdom and himself King of Ireland. The new English, whose power lay in the Pale of Dublin, then began to conquer the island. Gaelic kings were encouraged to apply for a surrender and regrant: to surrender their lands to the king, and then have them regranted as freeholds. Those who surrendered were also expected to follow English law and customs, speak English, and convert to the Protestant Anglican Church. Decades of conflict followed in the reign of Elizabeth I, culminating in the Nine Years' War (1594–1603). The war ended in defeat for the Irish Gaelic alliance, and brought an end to the independence of the last Irish Gaelic kingdoms. In 1603, with the Union of the Crowns, King James of Scotland also became king of England and Ireland. James saw the Gaels as a barbarous and rebellious people in need of civilising, and believed that Gaelic culture should be wiped out. Also, while most of Britain had converted to Protestantism, most Gaels had held on to Catholicism. When the leaders of the Irish Gaelic alliance fled Ireland in 1607, their lands were confiscated. James set about colonising this land with English-speaking Protestant settlers from Britain, in what became known as the Plantation of Ulster. It was meant to establish a loyal British Protestant colony in Ireland's most rebellious region and to sever Gaelic Ulster's links with Gaelic Scotland. In Scotland, James attempted to subdue the Gaelic clans and suppress their culture through laws such as the Statutes of Iona. He also attempted to colonise the Isle of Lewis with settlers from the Lowlands. Since then, the Gaelic language has gradually diminished in most of Ireland and Scotland. The 19th century was the turning point as The Great Hunger in Ireland, and across the Irish Sea the Highland Clearances, caused mass emigration (leading to Anglicisation, but also a large diaspora). The language was rolled back to the Gaelic strongholds of the north west of Scotland, the west of Ireland and Cape Breton Island in Nova Scotia. The Gaelic revival also occurred in the 19th century, with organisations such as Conradh na Gaeilge and An Comunn Gàidhealach attempting to restore the prestige of Gaelic culture and the socio-communal hegemony of the Gaelic languages. Many of the participants in the Irish Revolution of 1912–1923 were inspired by these ideals and so when a sovereign state was formed (the Irish Free State), post-colonial enthusiasm for the re-Gaelicisation of Ireland was high and promoted through public education. Results were very mixed however and the Gaeltacht where native speakers lived continued to retract. In the 1960s and 70s, pressure from groups such as Misneach (supported by Máirtín Ó Cadhain), the Gluaiseacht Chearta Siabhialta na Gaeltachta and others; particularly in Connemara; paved the way for the creation of development agencies such as Údarás na Gaeltachta and state media (television and radio) in Irish. The last native speaker of Manx died in the 1970s, though use of the Manx language never fully ceased. There is now a resurgent language movement and Manx is once again taught in all schools as a second language and in some as a first language. Gaelic society was traditionally made up of kin groups known as clans, each with its own territory and headed by a male chieftain. Succession to the chieftainship or kingship was through tanistry. When a man became chieftain or king, a relative was elected to be his deputy or 'tanist' (tánaiste). When the chieftain or king died, his tanist would automatically succeed him. The tanist had to share the same great-grandfather as his predecessor (i.e. was of the same derbfhine) and he was elected by freemen who also shared the same great-grandfather. Gaelic law is known as the Fénechas or Brehon law. The Gaels have always had a strong oral tradition, maintained by shanachies. In the ancient and medieval era, most Gaels lived in roundhouses and ringforts. 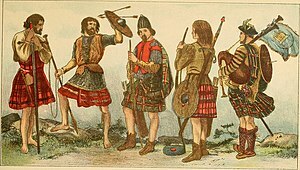 The Gaels had their own style of dress, which became the modern belted plaid and kilt in Scotland. They also have their own style of music and dance, and their own sports (see Gaelic games and Highland games). Auraicept na n-Éces, 7th century, explaining ogham. The Gaelic languages are part of the Celtic languages and fall under the wider Indo-European language family. There are two main historical theories concerning the origin and development of the Gaelic languages from a Proto-Celtic root: the North Atlantic-based Insular Celtic hypothesis posits that Goidelic and Brythonic languages have a more recent common ancestor than Continental Celtic languages, while the Q-Celtic and P-Celtic hypothesis posits that Goidelic is more closely related to the Celtiberian language, while Brythonic is closer to the Gaulish language. Estimates of the emergence of proto-Gaelic in Ireland vary widely from the introduction of agriculture c. 7000–6000 BC to around the first[clarification needed] few centuries BC. Little can be said with certainty, as the language now known as Old Irish—ancestral to modern Irish, Scots Gaelic and Manx—only began to be properly recorded with the Christianisation of Ireland in the 4th century, after the introduction of the Roman script. Primitive Irish does appear in a specialised written form, using a unique script known as Ogham. The oldest examples of Ogham have survived in the form of memorial inscriptions or short epitaphs on pillar-like stone monuments (see Mac Cairthinn mac Coelboth). Ogham stones are found throughout Ireland and neighbouring parts of Britain. This form of written Primitive Irish is thought to have been in use as early as 1000 BC. The script frequently encodes a name or description of the owner and surrounding region, and it is possible that the inscribed stones may have represented territorial claims. Respondents who stated they could speak Irish and Gaelic in the 2011 censuses. The Gaelic languages have been in steep decline since the beginning of the 19th century, when they were majority languages of Ireland and the Scottish Highlands; today they are endangered languages. The spread of the English language has resulted in a vast majority of people of Gaelic ancestry being unable to speak a Goidelic language. As far back as the Statutes of Kilkenny in 1366, the British government had dissuaded use of Gaelic for political reasons. The Statutes of Iona in 1609 and the SSPCK in the Highlands (for most of its history) are also notable examples. As the old Gaelic aristocracy were displaced or assimilated, the language lost its prestige and became primarily a peasant language, rather than one of education and government. During the 19th century, a number of Gaeilgeoir organisations were founded to promote a broad cultural and linguistic revival. Conradh na Gaeilge (English: the Gaelic League) was set up in 1893 and had its origins in Charles Owen O'Conor's Gaelic Union, itself a derivative of the Society for the Preservation of the Irish Language. Similar Highland Gaelic groups existed, such as An Comunn Gàidhealach. At this time, Irish Gaelic was widely spoken along the Western seaboard (and a few other enclaves) and the Gaelic League began defining it as the "Gaeltacht", idealised as the core of true Irish-Ireland, rather than the Anglo-dominated Dublin. Although the Gaelic League itself aimed to be apolitical, this ideal was attractive to militant republicans such as the Irish Republican Brotherhood, who formulated and led the Irish Revolution at the turn of the 20th century; a key leader, Pádraig Pearse, imagined an Ireland "Not merely Free but Gaelic as well – Not merely Gaelic but Free as well." Scottish Gaelic did not undergo as extensive of a politicalisation at this juncture, as nationalists there tended to focus on the Lowland mythos of William Wallace rather than the Gàidhealtachd. 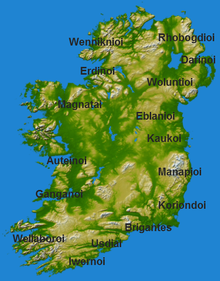 During the 1950s, the independent Irish state developed An Caighdeán Oifigiúil as a national standard for the Irish language (using elements from local dialects but leaning towards Connacht Irish), with a simplified spelling. Until 1973, school children had to pass Modern Irish to achieve a Leaving Cert and studying the subject remains obligatory. There are also Gaelscoileanna where children are taught exclusively through the medium of Irish. In the Gaeltacht itself, the language has continued to be in crisis under the pressure of globalism, but there are institutions such as Údarás na Gaeltachta and a Minister for the Gaeltacht, as well as media outlets such as TG4 and RTÉ Raidió na Gaeltachta to support it. The last native Manx Gaelic speaker died in 1974, although there are ongoing attempts at revival. While the Gàidhealtachd has retracted in the Highlands, Scottish Gaelic has enjoyed renewed support with the Gaelic Language (Scotland) Act 2005, establishing the Bòrd na Gàidhlig under the devolved Scottish Government. This has seen the growth of Gaelic medium education. There are also media outlets such as BBC Alba and BBC Radio nan Gàidheal, although these have been criticized for excessive use of English and pandering to an English-speaking audience. The traditional, or "pagan", worldview of the pre-Christian Gaels of Ireland is typically described as animistic, polytheistic, ancestor venerating and focused on the hero cult of archetypal Gaelic warriors such as Cú Chulainn and Fionn mac Cumhaill. The four seasonal festivals celebrated in the Gaelic calendar, still observed to this day, are Imbolc, Beltane, Lughnasadh and Samhain. While the general worldview of the Gaelic tradition has been recovered, a major issue for academic scholars is that Gaelic culture was oral prior to the coming of Christianity and monks were the first to record the beliefs of this rival worldview as a "mythology". Unlike other religions, there is no overall "holy book" systematically setting out exact rules to follow, but various works, such as the Lebor Gabála Érenn, Dindsenchas, Táin Bó Cúailnge and Acallam na Senórach, represent the metaphysical orientation of Gaelachas. The main gods held in high regard were the Tuatha Dé Danann, the superhuman beings said to have ruled Ireland before the coming of the Milesians, known in later times as the aes sídhe. Among the gods were male and female deities such as The Dagda, Lugh, Nuada, The Morrígan, Aengus, Brigid and Áine, as well as many others. Some of them were associated with specific social functions, seasonal events and personal archetypal qualities. Some physical locations of importance in Ireland related to these stories include the Brú na Bóinne, Hill of Tara and Hill of Uisneach. Although the sídhe were held to intervene in worldly affairs sometimes, particularly battles and issues of sovereignty, the gods were held to reside in the Otherworld, also known as Mag Mell (Plain of Joy) or Tír na nÓg (Land of the Young). This realm was variously held to be located on a set of islands or underground. The Gaels believed that certain heroic persons could gain access to this spiritual realm, as recounted in the various echtra (adventure) and immram (voyage) tales. The Gaels underwent Christianisation during the 5th century and that religion, de facto, remains the predominant one to this day, although irreligion is fast rising. At first the Christian Church had difficulty infiltrating Gaelic life: Ireland had never been part of the Roman Empire and was a decentralised tribal society, making patron-based mass conversion problematic. It gradually penetrated through the remnants of Roman Britain and is especially associated with the activities of Patrick, a Briton who had been a slave in Ireland. He tried to explain its doctrines by using elements of native folk tradition, so Gaelic culture itself was not completely cast aside and to some extent local Christianity was Gaelicised. The last High King inaugurated in the pagan style was Diarmait mac Cerbaill. The 6th-9th centuries are generally held to be the height of Gaelic Christianity, with numerous saints, scholars and works of devotional art. This balance began to unravel during the 12th century with the polemics of Bernard of Clairvaux, who attacked various Gaelic customs (including polygamy and hereditary clergy) as "pagan". The Catholic Church of the time, fresh from its split with the Orthodox Church, was becoming more centralised and uniform throughout Europe with the Gregorian Reform and military reliance on Germanic peoples at the fringes of Latin Christendom, particularly the warlike Normans. As part of this, the Catholic Church actively participated in the Norman conquest of Gaelic Ireland, with the issuing of Laudabiliter (claiming to gift the King of England the title "Lord of Ireland") and in Scotland strongly encouraged king David who Normanised that country. Even within orders such as the Franciscans, ethnic tensions between Norman and Gael continued throughout the later Middle Ages, as well as competition for ecclesiastic posts. During the 16th century, with the emergence of Protestantism and Tridentine Catholicism, a distinct Christian sectarianism made its way into Gaelic life, with societal effects carrying on down to this day. The Tudor state used the Anglican Church to bolster their power and enticed native elites into the project, without making much initial effort to convert the Irish Gaelic masses; meanwhile, the mass of Gaeldom (as well as the "Old English") became staunchly Catholic. Due to the geopolitical rivalry between Protestant Britain and Catholic France and Spain, the Catholic religion and its mostly Gaelic followers in Ireland were persecuted for a long time. In the Scottish Highlands too, the Gaels were generally slow to accept the Scottish Reformation. Efforts at persuading Highlanders in general of the value of this primarily Lowland movement were hampered by the complicated politics of the Highlands, with religious rivalries and clan antagonism becoming entwined (a prominent example was the intense rivalry, even hatred, between the generally Presbyterian Campbells and the generally Catholic MacDonalds), but most Highlanders later converted to Presbyterianism in the 19th century during the breakdown of the clan system. In a few remote areas, however, Catholicism was kept alive and even rejuvenated to some extent by Irish Franciscan missionaries, but in most of the Highlands it was replaced by Presbyterianism. The adoption of the Free Church of Scotland (1843–1900) in the Highlands following the Disruption of 1843 was a reassertion of Gaelic identity in opposition to forces of improvement and clearance. ^ Gaels have not yet received official recognition of being an indigenous people or the victims of colonization, however this argument has been advanced in regards by Scotland by notable historians such as Michael Newton, Alastair MacIntosh and Iain Mackinnon. ^ Census data for the United Kingdom are broken down on a constituency country basis. White Irish was an option in the ethnicity section of the 2011 Census of the United Kingdom; this did not distinguish between those of Gaelic-Irish descent and those of Anglo-Irish descent. The results for this were: 531,087 in England and Wales; 517,907 in Northern Ireland; and 53,000 in Scotland. According to the census, 83% (or 4,399,000) of the population in Scotland identified as "Scottish" and this did not distinguish between Gaelic Highlander and Anglo Lowlander ethnicities. In the rest of the United Kingdom, the Scots were included under White British. ^ A minority of historical revisionists have come to challenge the traditional account of the origins of Gaelic Scotland as being derived directly from Gaelic Ireland via population movement as laid out in works such as the Senchus fer n-Alban and the Annals of Tigernach. The pioneering figure in this direction is Dr. Ewan Campbell of the University of Glasgow with his 2001 paper Were the Scots Irish? ; an archaeologist, he argues that there is no evidence of mass population movement across the Irish Sea for this time period at Dunadd. ^ a b "Census 2011: 1.77m say they are able to speak Irish". The Journal. 7 February 2014. ^ a b c "Census 2011: Key Statistics for Northern Ireland" (PDF). Northern Ireland Statistics and Research Agency. 7 February 2014. ^ a b c d Osbourn 2006, p. 204. ^ a b c "National Household Survey (NHS) 2011". Statistics Canada. 8 May 2013. Retrieved 7 February 2015. ^ a b "The Irish language in Australia: sociocultural identity in diasporic minority language use". Jill Vaughan. 7 February 2015. ^ Brown, Daniel Guy (2014). "The Highland Clearances and the Politics of Memory". Retrieved 2 July 2017. ^ "The Scottish Highlands in Colonial & Psychodynamic Perspective". www.alastairmcintosh.com. Retrieved 2 July 2017. ^ Mackinnon, Iain (1 May 2017). "Colonialism and the Highland Clearances". Northern Scotland. 8 (1): 22–48. doi:10.3366/nor.2017.0125. ISSN 0306-5278. ^ a b c "Did the Irish Come from Spain?". History Ireland. Autumn 2001. ^ Woolf, Alex (2007). From Pictland to Alba, 789-1070. Edinburgh University Press. p. 283. ^ O'Leary 2004, p. 376. ^ a b "Gaelic". Online Etymology Dictionary. 6 November 2012. ^ "Gael". Online Etymology Dictionary. 6 November 2012. ^ a b c Koch 2004, p. 775. ^ "Goidel". Oxford English Dictionary. December 1989. Retrieved 14 April 2010. .
^ "Féni". Oxford Reference. 13 November 2012. doi:10.1093/acref/9780198609674.001.0001. ^ a b "Irish". Online Etymology Dictionary. 6 November 2012. ^ a b c "On the Origin of the Names Érainn and Ériu". T. F. O'Rahilly. 6 November 2012. JSTOR 30007646. ^ Koch 2004, p. 709. ^ S. M. Foster, Picts, Gaels and Scots: Early Historic Scotland, 2014. ^ Koch 2004, p. 1571. ^ a b "Scot". Online Etymology Dictionary. 13 February 2015. ^ "Erse". Online Etymology Dictionary. 13 February 2015. ^ "What is a Clan?" (PDF). Dr. Bruce Durie. 28 July 2015. ^ Byrne 1973, p. 291. ^ O'Duffy 2005, p. 263. ^ "Surnames in the Eoganacht sept project". Eoganacht Septs. 26 January 2015. ^ "Eo´ganacht septs". Family Tree DNA. 26 January 2015. ^ Thornton 2003, p. 201. ^ "Origins Part 2: Clan Colla and the Origins of Clan Donald". Clan Donald Heritage. 26 January 2015. ^ "DNA of the Three Collas". Peter Biggins. 26 January 2015. ^ Ellis 2002, p. 351. ^ Ellis 2002, p. 95. ^ "About the Clans of Ireland". Finte na hÉireann. 29 January 2015. ^ "The Highland origin of Clans". Association of Highland Clans & Societies. 29 January 2015. ^ "A Y-Chromosome Signature of Hegemony in Gaelic Ireland". American Journal of Human Genetics. 26 January 2015. PMC 1380239. ^ "Genetic investigation of the patrilineal kinship structure of early Medieval Ireland". American Journal of Physical Anthropology. 26 January 2015. doi:10.1002/(ISSN)1096-8644. ^ a b c d e "Haplogroup R1b (Y-DNA)". Eupedia. 26 January 2015. ^ "A Predominantly Neolithic Origin for European Paternal Lineages". PLOS Biology. 26 January 2015. doi:10.1371/journal.pbio.1000285. ^ "Insights Into the O'Neills of Ireland from DNA Testing". Edwin. B. O'Neill. 26 January 2015. Archived from the original on 3 March 2016. ^ "A Set of Distinctive Marker Values Defines a Y-STR Signature for Gaelic Dalcassian Families". Denis M. Wright. 26 January 2015. ^ "What's in a name? Y chromosomes, surnames and the genetic genealogy revolution" (PDF). Cell Press. 6 February 2015. ^ "Central Statistics Office Ireland – Irish ability, persons aged 3 years and over". Archived from the original on 25 July 2011. Retrieved 14 August 2008. ^ "2011 Census for England and Wales: Religion and Ethnicity Data Overview" (PDF). BRAP. 7 February 2014. ^ "Manx". World Directory of Minorities and Indigenous Peoples. 7 February 2014. Archived from the original on 7 March 2015. ^ a b "Selected Social Characteristics in the United States (DP02): 2013 American Community Survey 1-Year Estimates". U.S. Census Bureau. Retrieved 11 December 2014. ^ a b "Visual census, Ethnic origin and visible minorities, Canada". Statistics Canada. 7 December 2010. Retrieved 7 February 2015. ^ "The People of Australia: Statistics from the 2013 Census" (PDF). Department of Immigration and Border Protection. 7 February 2015. ^ "Census reveals scale of NZ Irish population". Irish Echo. 7 February 2015. Archived from the original on 8 February 2015. ^ "Seventh-Century Ireland as a Study Abroad Destination" (PDF). Colin Ireland. 10 February 2015. ^ ""They Accuse Us of Being Descended from Slaves": Settlement History, Cultural Syncretism and the Foundation of Medieval Icelandic Identity". Rutgers University. 10 February 2015. Archived from the original on 11 February 2015. Retrieved 10 February 2015. ^ Ó Cróinín 2005, p. 166. ^ Rankin 2002, p. 306. ^ Byrne 1973, p. 73. ^ a b c Foster, Robert (2001). The Oxford History of Ireland. Oxford University Press. pp. 5–7. ^ Byrne 1973, p. 72. ^ a b c d e "The Adoption of Christianity by the Irish and Anglo-Saxons: The Creation of Two Different Christian Societies". Thomas Martz. 8 February 2015. ^ Stafford, Pauline (2013). A Companion to the Early Middle Ages: Britain and Ireland c.500 - 1100. John Wiley & Sons. ISBN 9781118499474. ^ Duffy, Seán (2005). Medieval Ireland: An Encyclopedia. Routledge. p. 421. ^ Byrne 1973, p. 180. ^ a b "Ancient Ireland: The Monastic Tradition". Daily Kos. 28 March 2015. ^ MacManus 1921, p. 215. ^ "John Scottus Eriugena". Stanford Encyclopedia of Philosophy. 28 March 2015. ^ Ureland, Per Sture (1996). Language Contact across the North Atlantic. Walter de Gruyter. pp. 115–116. ^ Taylor, Alice (2016). The Shape of the State in Medieval Scotland, 1124-1290. Oxford University Press. pp. 17–18. ^ Duffy, Seán (2002). Robert the Bruce's Irish Wars. Tempus Publishing. p. 129. ^ a b "Driving a Wedge within Gaeldom". History Ireland. 24 February 2015. ^ a b Ellis, Steven (2014). The Making of the British Isles: The State of Britain and Ireland, 1450-1660. Routledge. p. 296. ^ Szasz, Margaret (2007). Scottish Highlanders and Native Americans. University of Oklahoma Press. p. 48. ^ Nicholls, Kenneth W. (2008) . "Chapter XIV: Gaelic society and economy". In Cosgrove, Art (ed.). A New History of Ireland, Volume II: Medieval Ireland 1169-1534. Oxford University Press. pp. 397–438. doi:10.1093/acprof:oso/9780199539703.003.0015. ISBN 978-0-19-953970-3. ^ Newton, Michael (2000). A handbook of the Scottish Gaelic world. Four Courts Press. p. 114. ^ Glaser, Konstanze (2007). Minority Languages and Cultural Diversity in Europe. Multilingual Matters. pp. 265–266. ^ "Irish as an endangered language". Marlyhurst University. 21 July 2015. Archived from the original on 6 September 2015. ^ "'Endangered' Gaelic on map of world's dead languages". The Scotsman. 21 July 2015. ^ "Words Between Worlds: The Irish Language, the English Army, and the Violence of Translation in Brian Friel's Translations". Collin Meissner. 21 July 2015. ^ "Let's speak Gaeilge however we can and wherever we want". Irish Examiner. 21 July 2015. ^ Tanner 2006, p. 65. ^ "Manx: Bringing a language back from the dead". BBC. 21 July 2015. ^ "Language as activism: the big Gaelic comeback". New Statesman. 21 July 2015. ^ "BBC Alba is not a Gaelic channel". BBCAlbaNews. 9 September 2014. Retrieved 12 September 2014. ^ Welch 1992, p. 4. ^ Welch 1992, p. 12. ^ Welch 1992, p. 2. ^ "Religiosity Plummets in Ireland and Declines Worldwide; Atheism On the Rise". Huffington Post. 21 July 2015. ^ "Marriage in Medieval Ireland by Art Cosgrove". History Ireland. 21 July 2015. ^ Bradshaw 1993, p. 26. ^ "Two nations, one order: the Franciscans in medieval Ireland". History Ireland. 21 July 2015. ^ Lynch, Michael (2007). The Oxford Companion to Scottish History. Oxford University Press. p. 85. ISBN 978-0199234820. Retrieved 2 July 2017. ^ Withers, Charles W. J. (2015). Gaelic Scotland: The Transformation of a Culture Region. Routledge. p. 342. ISBN 9781317332817. ^ Symonds, James (1999). "Toiling in the Vale of Tears: Everyday Life and Resistance in South Uist, Outer Hebrides, 1760—1860". International Journal of Historical Archaeology. 3 (2): 101–122. doi:10.1023/A:1021949701139. JSTOR 20852924. Bartlett, Robert (1994). The Making of Europe: Conquest, Colonization and Cultural Change, 950-1350. Penguin. ISBN 978-0140154092. Bateman, Mary (2007). Duanaire Na Sracaire: Songbook of the Pillagers, Anthology of Scottish Gaelic Verse to 1600. Birlinn. ISBN 978-1841581811. Bradshaw, Brendan (1993). Representing Ireland: Literature and the Origins of Conflict, 1534-1660. Cambridge University Press. ISBN 978-0521416344. Bradshaw, Brendan (2015). 'And so began the Irish Nation': Nationality, National Consciousness and Nationalism in Pre-modern Ireland. Ashgate Publishing. ISBN 978-1472442567. Byrne, Francis J. (1973). Irish Kings and High Kings. Four Courts Press. ISBN 978-1851821969. Calloway, Colin G. (2010). White People, Indians, and Highlanders: Tribal People and Colonial Encounters in Scotland and America. Oxford University Press. ISBN 978-0199737826. Canny, Nicholas (2001). Making Ireland British, 1580-1650. OUP Oxford. ISBN 978-0199259052. Charles-Edwards, T. M. (2007). Early Christian Ireland. Cambridge University Press. ISBN 9780521037167. Clancy, Thomas Owen (2008). The Triumph Tree: Scotland's Earliest Poetry AD 550-1350. Canongate Classics. ISBN 978-0862417871. Connolly, S. J. (2009). Contested Island: Ireland 1460-1630. OUP Oxford. ISBN 978-0199563715. Connolly, S. J. (2010). Divided Kingdom: Ireland 1630-1800. OUP Oxford. ISBN 978-0199583874. Coogan, Tim Pat (2013). The Famine Plot: England's Role in Ireland's Greatest Tragedy. Palgrave Macmillan. ISBN 978-1137278838. Crowley, Tony (2008). Wars of Words: The Politics of Language in Ireland 1537-2004. OUP Oxford. ISBN 978-0199532766. Doyle, Aidan (2015). A History of the Irish Language: From the Norman Invasion to Independence. OUP Oxford. ISBN 978-0198724766. Ellis, Peter Berresford (2002). Erin's Blood Royal: The Gaelic Noble Dynasties of Ireland. Palgrave Macmillan. ISBN 978-0312230494. Denvir, John (1892). The Irish in Britain from the Earliest Times to the Fall and Death of Parnell. Kegan Paul, Trench, Trübner. Gibbons, Luke (2004). Gaelic Gothic: Race, Colonization and Irish Culture. Alren House. ISBN 978-1903631393. Gibson, D. Blair (2012). From Chiefdom to State in Early Ireland. Cambridge University Press. ISBN 978-1107015630. Harbison, Peter (1999). The Golden Age of Irish Art: The Medieval Achievement 600-1200. Thames & Hudson. ISBN 978-0500019276. Kinsella, Thomas (1981). An Duanaire 1600-1900: Poems of the Dispossessed. Dolmen Press. ISBN 978-0851053646. Koch, John T. (2004) . "Celts, Britons, and Gaels—Names, Peoples, and Identities". Trafodion Anhrydeddus Gymdeithas y Cymmrodorion; cyfres newydd. vol. 9. The Honourable Society of Cymmrodorion. pp. 41–56. ISSN 0959-3632. Koch, John T. (2004). Celtic Culture: A Historical Encyclopedia. ABC-CLIO. ISBN 978-1851094400. Leerssen, Joep (1997). Mere Irish and Fior-Ghael: Studies in the Idea of Irish Nationality, Its Development and Literary Expression Prior to the Nineteenth Century. University of Notre Dame Press. ISBN 978-0268014278. Lenihan, Patrick (2007). Consolidating Conquest: Ireland 1603-1727. Routledge. ISBN 978-0582772175. Mac Giolla Chríost, Diarmait (2005). The Irish Language in Ireland: From Goídel to Globalisation. Routledge. ISBN 978-0415320467. Mac Síomoín, Tomás (2014). The Broken Harp: Identity and Language in Modern Ireland. Nuascealta. ISBN 978-1502974570. Macleod, John (1997). Highlanders: A History of the Gaels. Sceptre. ISBN 978-0340639917. MacManus, Seamus (1921). The Story of the Irish Race: A Popular History of Ireland. The Irish Publishing Company. ISBN 978-0-517-06408-5. McLeod, Wilson (2004). Divided Gaels: Gaelic Cultural Identities in Scotland and Ireland C.1200-C.1650. OUP Oxford. ISBN 978-0199247226. Newton, Michael (2000). A Handbook of the Scottish Gaelic World. Four Courts Press. ISBN 978-1851825417. Newton, Michael (2009). Warriors of the Word: The World of the Scottish Highlanders. Birlinn. ISBN 978-1841588261. O'Callaghan, Sean (2001). To Hell or Barbados: The Ethnic Cleansing of Ireland. Brandon. ISBN 978-0863222870. O'Conor Don, Charles (1753). Dissertations On the Ancient History of Ireland. J. Christie. Ó Cróinín, Dáibhí (2005). A New History of Ireland, Volume I: Prehistoric and Early Ireland. Oxford University Press. ISBN 9780199226658. O'Duffy, Séan (2005). Medieval Ireland: An Encyclopedia. Routledge. ISBN 978-1135948245. Ó Flaithbheartaigh, Ruaidhrí (1685). Ogygia: A Chronological Account of Irish Events. B. Tooke. O'Halloran, Sylvester (1778). A General History of Ireland. Hamilton. Ó hÓgáin, Dáithí (2001). The Sacred Isle: Belief and Religion in Pre-Christian Ireland. Boydell Press. ISBN 9780851157474. O'Leary, Philip (2004). The Prose Literature of the Gaelic Revival, 1881-1921. Pennsylvania State University Press. ISBN 978-0271025964. Ó Muraíle, Nollaig (2004). The Great Book of Irish Genealogies. De Burca Books. ISBN 978-0946130368. O'Sullivan Beare, Philip (1621). Catholic History of Ireland. Spain. Osbourn, Terry A. (2006). Teaching World Languages for Social Justice: A Sourcebook of Principles and Practices. Routledge. ISBN 978-1135609856. Patterson, Nerys T. (1991). Cattle Lords and Clansmen: The Social Structure of Early Ireland. Garland Press. ISBN 9780268008000. Rankin, David (2002). Celts and the Classical World. Routledge. ISBN 978-1134747214. Richards, Eric (1999). Patrick Sellar and the Highland Clearances: Homicide, Eviction and the Price of Progress. Edinburgh University Press. ISBN 9781902930138. Tanner, Marcus (2006). The Last of the Celts. Yale University Press. ISBN 9780300115352. Thornton, David E. (2003). Kings, Chronologies, and Genealogies: Studies in the Political History of Early Medieval Ireland and Wales. Occasional Publications UPR. ISBN 978-1900934091. Welch, Robert (1992). Irish Writers and Religion. Rowman & Littlefield. ISBN 978-0389209638. Watson, Moray (2010). The Edinburgh Companion to the Gaelic Language. Edinburgh University Press. ISBN 978-0748637096. Woolfe, Alex (2007). From Pictland to Alba, 789-1070. Edinburgh University Press. ISBN 978-0748612338.